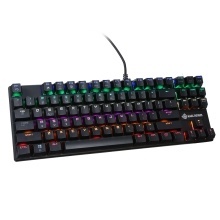 MAGIC-REFINER Mechanical Keyboard is designed for game player. 87 N-key rollover key gives you ultimate game experience. Mechanical blue switch brings quick response and let you enjoy smooth game playing. To give you pure experience. 4.0mm pressing adjusts for player hoping to have quick key pressing. With blue switch, it brings you excellent experience. Aluminium panel brings beautiful look and sturdy surface that let blue switch be crisp and lightweight. Compact size matches with fancy light design. Ergonomic function design gives you different experience. 87 keys full-size key design. Realize N-key rollover under USB port. Professional equipment brings smooth game experience. Ergonomic curved design. Sleek profile and scientific adjustment and comfortable touch.